Li Keqiang, Vice Premier of the State Council of the People’s Republic of China, declared open the games to the roaring cheers of 60,000 spectators in the Aoti Main Stadium in Guangzhou, capital of Guangdong province. Asia has a long and proud history in staging major Paralympic events, dating back to the first FESPIC Games (the Far East and South Pacific Games for the Disabled) in 1975. But it is the first time that a multi-sport para games run parallel to the Asian Games. October 9 2010: Carry forward the Olympic spirit and promote the Olympic Movement in Asia; enhance solidarity, friendship and exchanges among Asian countries and regions, and contribute to the establishment of a harmonious Asia. Vision: Thrilling Games, Harmonious Asia. On March 9th, the ceremony of the launch of the vision and the awarding of emblem design for the 16th Asian Games was held in Guangzhou. During this ceremony, “Thrilling Games, Harmonious Asia” was officially announced as the vision of the Games. The solicitation of the vision and the emblem of the Games lasted from July 8th to August 15th, 2006. GAGOC has collected 1738 versions for the vision and 2555 pieces (series) of proposed designs for the emblem. After several rounds of discussion and evaluation by the experts, “Thrilling Games, Harmonious Asia” was finalized as the vision of the 16th Asian Games. The vision is the soul and spirit of the Games. It conveys the missions and principles of GAGOC who aims to host a splendid, vigorous, wholesome and exciting sport festival. The vision “Thrilling Games, Harmonious Asia” reflects the theme of the times, the purposes of the Games and the common wishes of Asian people. The launch of the vision is marked as one of the milestones in the preparation work of GAGOC. By hosting the 16th Asian Games, Guangzhou aims to accelerate its modernization drive, enhance the city’s competitiveness, enrich its cultural atmosphere and speed up the development of a harmonious Guangzhou. 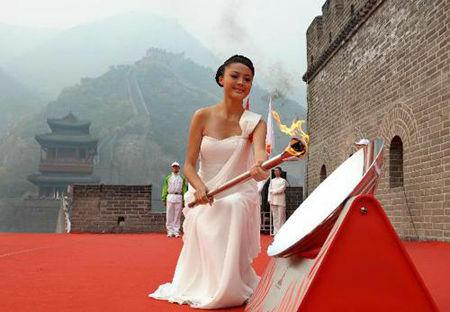 The flame of the Guangzhou Asian Games has been collected at the Great Wall in northern Beijing on October 9th 2010. The flame was successful lit despite an overcast morning in the capital city. Typhoon Megi’s threat against south China’s Guangzhou, the host of the upcoming Asian Games, appeared to ease as it turned east on Thursday evening, and the Games will be safe against Typhoon Megi, an unnamed Games official said on Friday. According to the official, all of 66 venues for the Asian Games have launched the emergency plan. More than 3,000 thousand people have been in readiness for dealing the emergence for 24 hours a day. Apart form Typhoon Megi, astronomical tide will sweep the mouth of the Perl River on Saturday. “The mixture of the two powers will be considerably strong”, said the official with the Ocean Bureau of Guangzhou. According to the lasted weather forecast, the water level at the mouth of Perl River will rise by about 50cm, exceeding the alert water level. “But we are well prepared for the worst, Asian Games will be held on time and in good quality”, the official said.